The gamma radiation in samples of a variety of natural tiling granite rocks from different quarries located in South Sinai, Egypt used in the building industry is measured, using high-resolution g-ray spectroscopy. The samples pulverized, sealed in plastic Marinelli beakers, are analyzed in the laboratory with an accumulating time between 18 and 24 h each. Activity concentrations are determined for 238 U (from 18 to 361 Bq/kg), 232 Th (range from 20 to 316 Bq/kg) and 40 K (from 499 to 3089 Bq/kg). The total absorbed dose rates in air ranged from 42 to 440 nGy/h. The external hazard index ranged (from 0.23 to 2.49), the internal hazard index ranged (from 0.28 to 3.38), and the activity utilization index ranged (from 0.69 to 5.90). Applying dose criteria recently recommended by the European Union for superficial materials, 25 of the samples meet the exemption dose limit of 0.3 mSv/year, two of them meet the upper dose limit of 1 mSv/year and only one clearly exceeds this limit. Environmental pollution by chemical pollutants such as heavy metals, radionuclides, and anionic constituents such as sulfate and nitrate originated from mines and mining operations can become a very important source of contamination in water. Pollutants mainly present in the chemical industrial wastes as well as in the low level liquid releases from the nuclear fuel cycle. The solid hazardous radioactive wastes arising are usually disposed of in near surface/shallow land burial facilities. The heavy metals components of these solid wastes (radioactive and stable) could find their way either into the ground water through infiltrating water or to the soil by runoff. 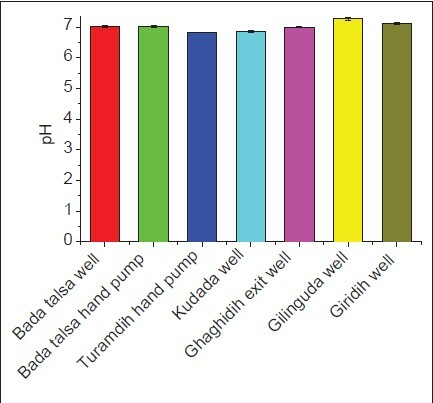 In this study, an approach is made for distribution of pollutants in ground water collected from seven locations around the premises of a uranium mining site, Turamdih located at Jharkhand state of India. Major and trace elements such as Na, K, Zn, Ni, Mn, Fe, Pb, Cu, Al, Ba, Mo, and U, etc., were analyzed using inductively coupled plasma-atomic emission spectrometry and differential pulse adsorptive stripping voltammetry. Sulfate, nitrate, chloride, and fluoride were analyzed using ion chromatogram. Bicarbonate was analyzed by titration method. Unconformity type of uranium deposits at Lambapur and Peddagattu located in Nalgonda District of Andhra Pradesh, India has been reported. Soil surveillance for isotopic thorium belonging to two different radioactive decay chains provide information on characterization of soil formation due to weathering of underlying host rocks. Thorium concentration and their isotopic activity ratio in localized soil samples were assessed. Thorium concentration and 230 Th/ 232 Th activity ratio were observed to be in the range of 15 ± 3 mg/kg to 132 ± 15 mg/kg and 0.21 ± 0.07-0.68 ± 0.05, respectively. A significant wide variation in thorium concentration and that of activity ratio for localized area soil indicates the soil development due to a different type of underlying host rocks. Activity ratio of 228 Th/ 232 Th in the soil samples of the study area are observed to vary from 0.87 ± 0.05 to 1.07 ± 0.15 with a mean of 0.96 ± 0.02, indicating secular equilibrium between 232 Th and its daughter product 228 Th. The study describes the application of isotopic thorium activity as a chronological indicator for geological characterization. 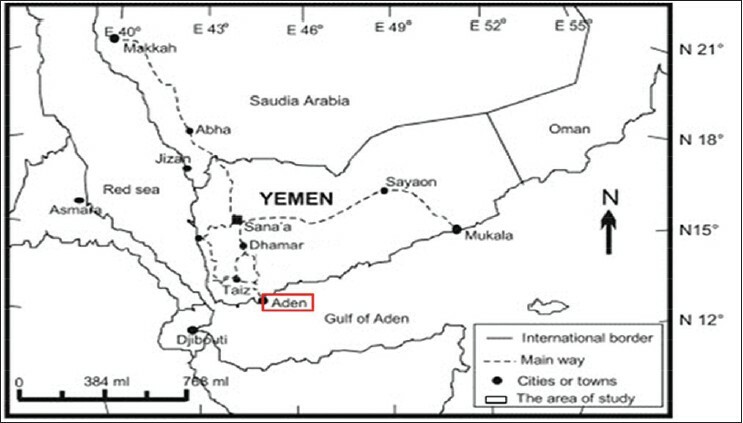 This paper presents the concentrations of naturally occurring radionuclides 226 Ra, 232 Th and 40 K measured in groundwater samples collected from Aden governorate South of Yemen Region using gamma spectroscopy. A total of 37 groundwater samples were collected from four areas in Aden governorate. The average activity concentrations for groundwater from Beer Ahmed area were 1.60 Bq/L, 1.25 Bq/L and 16.90 Bq/L for 226 Ra, 232 Th and 40 K respectively and from Beer Fadle area were 1.45 Bq/L, 0.87 Bq/L and 19.8 Bq/L for 226 Ra, 232 Th and 40 K, respectively, while that for groundwater samples from Daar-saad area were 1.27 Bq/L, 1.18 Bq/L and 18.28 Bq/L for 226 Ra, 232 Th and 40 K, respectively and Al-Masabian area were 1.55 Bq/L, 1.421 Bq/L and 19.03 Bq/L for 226 Ra, 232 Th and 40 K respectively. Furthermore, annual effective dose equivalent of ingestion of these waters was calculated. The results showed that the annual dose obtained in the present study was much higher than the recommended value (0.1 mSv/year) as reported by WHO. The results were compared with those for drinking water. 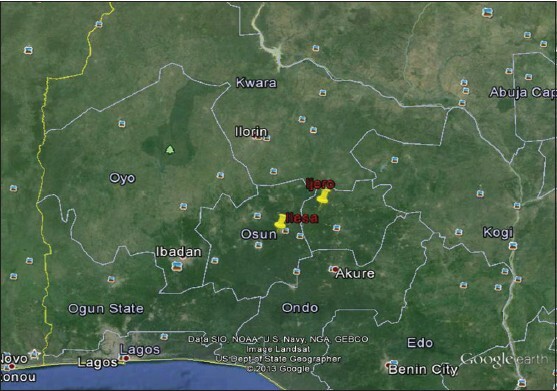 The activity concentrations of natural radionuclides in tailing enriched soil and sediment samples collected from two mining sites in southwest Nigeria are reported. 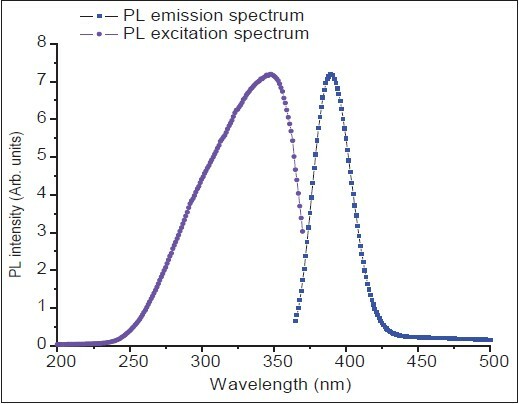 The samples were analyzed by gamma spectrometry with low background NaI (Tl) detector. The activity concentrations of 40 K, 226 Ra and 232 Th in all the measured samples varied from 249.66 to 1459.25 Bq/kg, 7.62 to 50.31 Bq/kg and 12.68 to 234.18 Bq/kg, respectively in soil samples. For sediment samples, the values varied from 241.86 to 1590.40 Bq/kg, 9.86 to 74.8 Bq/kg and 15.47 to 145.46 Bq/kg for 40 K, 226 Ra and 232 Th, respectively. The results show that the mean activity concentrations of the radionuclides in soil and sediment of the study area are higher than their world-wide average crustal values. The mean concentration of 232 Th is >6 times higher than that of 226 Ra in soil samples from Ijero mining site. This shows that 232 Th is slightly enhanced in the soil from this location than 226 Ra. In order to evaluate the radiological hazards of the natural radioactivity, the radium equivalent activity, external hazard index, absorbed gamma dose rates and the annual effective dose rates were determined. All these hazard indices have mean values, which are within their acceptable limits but higher than their world average values. Uranium is a naturally occurring radioactive element that is both radiologically and chemically toxic. The presence of uranium in the aquatic environment is due to the leaching from natural deposits, release in mill tailings, the combustion of coal and other fuels, and the use of phosphate fertilizers that contain uranium. Intake of uranium through air and water is normally low, but in circumstances in which uranium is present in a drinking water source, the majority of intake can be through drinking water route. 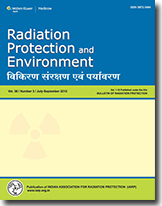 The uranium concentrations in ground water samples from Vishakhapatnam, India were estimated using laser fluorimetric technique and were observed to range from 0.6 to 12.3 ppb. The laser fluorimetry technique was found to be an excellent tool for direct measurement of uranium concentration in water samples at ultra-trace levels. The annual effective dose, cumulative dose for 70 years and the lifetime excess cancer risk from drinking of this water were calculated. The risks were low averaging only 10.6 × 10 -6 as none of the samples were observed to exceed the WHO recommended uranium concentration limit of 30 ppb. Measurement of radiation levels in difficult-to-access and hazardous areas, such as hot cells, high active source storage areas, require refined and sensitive remote radiation level measurement techniques. Optical fiber dosimetry has been studied as an emerging method of monitoring radiation remotely and is suitable for use in confined environments that may be inaccessible using existing conventional electronic dosimeters or radiation survey meters. Being light weight and nonintrusive, optical fibers based dosimeters provide several advantages in the field of remote radiation dosimetry and in-vivo medical applications. A prototype fiber optic dosimetry system with extrinsic architecture is designed and developed using optically stimulated luminescence (OSL) technique at Radiological safety division, Indira Gandhi Centre for Atomic Research. The fiber optic dosimetry system uses OSL material like BaFBr: Eu to detect radiation and a bifurcated optical cable to illuminate the sensor with the suitable light source and also to guide the light from the sensor to the detector. Indigenously developed hardware is used for pulse processing and application software of the system is developed in Microsoft Visual Basic.Net. This paper depicts the characterization of the dosimetric material, development of hardware and software for the system and calibration of the system using standard source. The system uses Advantech APAX 5570 base controller with suitable modular add-on cards for data acquisition and controlling. Indigenously developed electronics is used for processing the pulses from the sensor attached to the tip of the bifurcated optical cable. The acquisition of the counts from the electronic circuit and illumination and bleaching time for the sensor pellet is controlled by application software developed in VB.Net. The system is calibrated by irradiating the pellet with different absorbed doses. The system explores the possibility of remote radiation monitoring using OSL technique in real time. The system is portable, simple to use and requires less user intervention to operate. 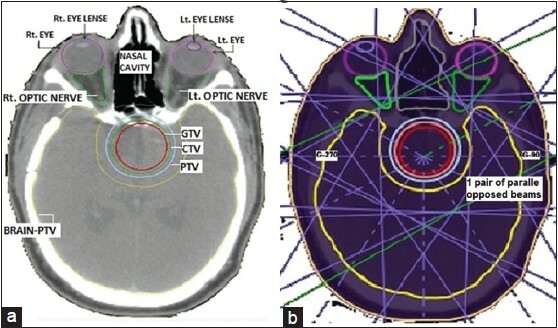 The purpose of this study was to analyze the dosimetric parameters of intensity modulated radiotherapy (IMRT) plans with a set of beams having one or more pairs of parallel opposed beams for the pelvis, head-and-neck (H and N) and brain cases having large secondary nodes. We selected three pelvis (carcinoma of prostate with pelvic bony mets), three H and N (two cases of carcinoma of the parotid with large secondary nodes and one case of carcinoma of the base of the tongue with large secondary nodes), and three brain (glioblastoma multiform) IMRT patients. IMRT plans were done with a set of 6-9 beams having one or more pairs of parallel opposed beams. Each plan was done using 6 MV photon energy. Each plan was analyzed on the basis of planning target volume (PTV) coverage with 93%, 95%, 100%, 107%, and 110% of the prescribed dose (PD), organs at risk (OAR) doses, homogeneity index (HI), conformity index (CI), and normal tissue integral dose (NTID). The doses to OARs were well within tolerance limits and the PTV coverage for 93%, 95%, and 100% of PD was obtained very well (followed the radiation therapy oncology group criteria "95% and 99% volume of PTV should receive 95% and 93% of the PD, respectively"), and values of HI, CI, and NTID were also satisfactory. In summary, very good OAR sparing and PTV coverage were observed in all plans. Hence, it can be concluded that use of one or more pairs of parallel opposed beams in IMRT plans in some special cases as selected for this study offers the benefit in terms of critical target volume irradiation, while maintaining the OAR within tolerable limits.